Have you ever visited a friends home during the fall or winter months and noticed sagging gutters, or gutters that have pulled away from the roof-line in some areas? Have you had to avoid rain water dripping from the middle of a gutter system simply because the gutter is sagging and unable to support the weight of the downpour? Any indication of sagging or less than secure gutters from the fascia — you have loose nails. Leaving your gutters for a long period of time in this condition allows water and debris to accumulate. This debris can cause additional downward pull permanently damaging your gutter system—rendering the compromised system incapable of moving debris away from your roof-line—which is typically one of the top five assets of any property. Longevity is typically the difference between a gutter system secured by nails or screws. How is your gutter system secured? 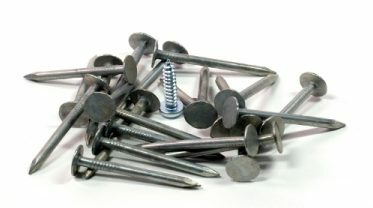 At CR Gutters, Inc., we only use screws! Nails (or spikes): Generally, an older style method, the nail goes through the outside of the gutter, and passes through the inside and attaches into the fascia board and rafter. This method of installing gutters is a less expensive cost for the gutter company using this method. The problem that occurs with nails is they tend to pull out over time. Debris, water and more can add weight to a gutter system causing sagging and detachment overtime. It is not a surprise that most if not all homeowners end up spending time through the life of their gutter system, pounding back the nails as they inch their way out. While this is a temporary solution to re-secure loosened nails–over time the hole that the nail resides widens and will no longer support the both the weight of the gutter and the debris the gutter is supposed to keep from your roof line. Screws: A more reliable method because screws don’t pull out over time. Our Installers use a pre-loaded hanger with screws to attach the gutter to the home through the fascia board and into the rafter. All hangers are hidden and fasten to the inside of the gutter for a more professional continuous look to your new gutters. HOT AND COLD: Finally, you may be surprised to learn that the hot and cold months that we experience in the Northwest can also cause nails (spikes) to loosen over time. As the temperature changes from hot to cold, your gutters will expand and contract—and so does the metal nails securing your gutter system. As the gutter warms up, it can literally put enough pressure on nails to push them out over time. Periodic inspection of the gutter system each year is advised.